How could TariffEye be used in accounting? I’m sorry after re-reading this document, I notice that it it’s more a personal note, than something readable by someone else. I wish it will be useful for you even if not all the context is explained. We are talking about using TariffEye data-engine with an accounting system, in order to calculate fees. Those are fixed fees that are issued periodically. Those fees are issued when normalized events occur; for example a transaction, a new position. The value of the fee depends on the state of the portfolio at a certain time. Tariffs depend on a global politic for each institution, but for some group of customers some other tariffs may applies, this occur also on a per portfolio basis. For each fee, an explanation will be issued to the customer. Tarification which contains a collection of Tarifs. Tarifs are small fee calculation elements, their context of application is defined by bidimensional Trees. 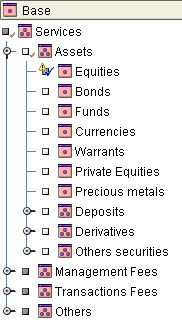 This architecture defines also the containers for Options (conditional states of the portfolio) and calculus structures. Data manipulation is made by manipulating Java objects. 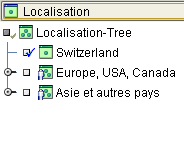 A Tarification is serializable using the former Java Serializer and JavaBeans XML serialization. The calculation engine was designed to keep track of every calculation with their comment, this is done by a “Visitor”. Tarif objects are not participating in the fee calculation; they are the containers for Worksheets that take this in charge. A worksheet, accept the “visit” of the calculation engine; it may request pre-calculation of other worksheets by the calculation engine. Discounts are attached to Worksheets, they participate to the calculus AFTER other elements calculation. 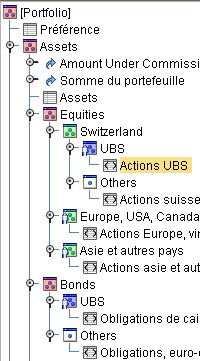 Portfolio data should be accessed from an external database. 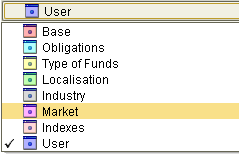 Accessing Portfolio data (options, assets, and transactions) should be easy. The main difficulty will come in representing the tariffs data and version in a hierarchical way. It should be easy to request from the central database the tariff for portfolio ABCD and handle specific discounts, but also to modify the tariff for all the customers for one specified product. Another solution would be to keep one Tariff database per portfolio (as it is today). And to achieve the “modify this product tariff for all customers” request will enumerate and modify, one by one user Tariffs; this no a “so-stupid” solution as having a too complicated relational database to handle versioning may be more difficult to manage than redundant information. TariffEye is not “time aware” and is designed to calculate all the fees in a row, so the calculation engine cannot be reused for a real accounting system. The request calculation system should be simpler than the actual one. Including time in the calculation and data retrieval will not modify TariffEye architecture and should imply a small amount of coding. TariffEye model, perfectly describe any bank Tariff encountered, and the level of abstraction makes easy the integration of new Tariff concepts. What is for sure reusable in TariffEye is the way Tariffs are conceptualized. The UI, permit all the manipulation and visualization a user would need. Using TariffEye as the end-user discount and special tariffs attribution by hooking TariffEye to another fee-calculation system may be quite easy to do. TariffEye is a standalone real-time calculation tool, all the code was turned on performance optimisation, hard testing and code reviewing is needed to use it in an accounting system.